ImaginEERIEing offers some really cool digital puppetry software that, when done correctly, can add tons of fun to your haunt. The original iteration of this was the “Mirror” routine was developed in 2004 and they have since increased their lineup of puppets. 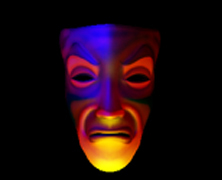 The puppets are simply computer programs which display spooky characters on the screen and allow the user to control them with a keyboard, a microphone, or a prerecorded audio routine. When the the monitor is placed behind the facade of a mirror it allows for quite an impressive illusion. Add some real time interaction with the crowd and it’s even better! The original Mirror routine is free to download, while the others are priced at a modest $15 per routine.